Forty golfers from Mexico, forty from the United States and forty from Canada will compete for the honor of flying their flag on the top mast of North American golf; the signature trophy is a beaded jaguar, as well as a car for a hole-in-one at hole 8 and many additional prizes. The Flamingos Golf Course and the Riviera Nayarit Convention and Visitors Bureau (CVB) welcome golfers to the IV International CANAMEX Flamingos Riviera Nayarit Cup 2016 next Saturday, February 20. “By organizing this tournament we’re looking to unite these three important nations in Banderas Bay so they can enjoy a fun day of competition on the greens,” said Enrique Gómez, Director of Sales for the course, who thanked local businessmen for supporting this growing event. 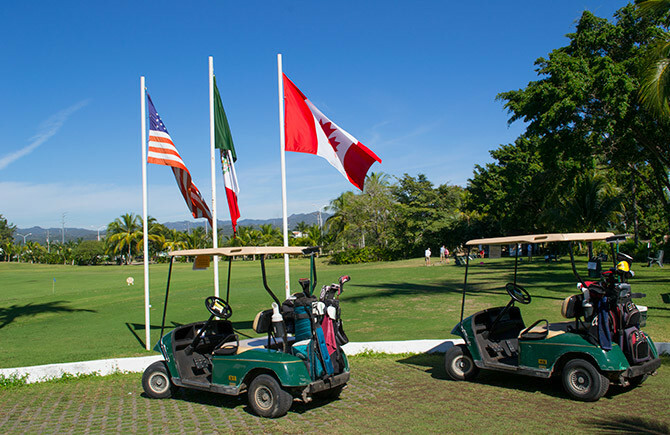 Forty golfers from Mexico, forty from the United States and forty from Canada will compete for the honor of flying their flag on the top mast of North American golf. The reigning champion, Mexico, will be defending its title against the United States and Canada. The 18 holes will be played as follows: 9 holes A Go-Go and 9 holes best score for twosomes per hole. The prizes for hole-in-ones will be a 2016 Buick Verano at hole 8, a golf cart for hole 6 and a one-year membership for hole 16. The raffle prizes include television sets, sound equipment, one driver, different golf products and, as a final grand prize, a complete set by Titleist: golf bag with one driver, two woods, set of irons and a putter. Plus, of course, the signature trophy, a beaded jaguar. Registration fee is MEX$1,300 per player and includes meals during the competition. There are still spots available on all three teams. For more information and tournament registration please call 01 (329) 296 5006. Visit: http://flamingosgolf.com.mx/.